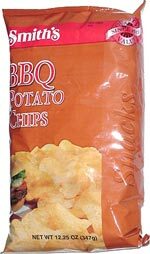 Taste test: These are mildly flavored but good store-brand barbecue potato chips. They've got a sweet barbecue taste, with a very slight aftertaste. They leave a very slight oily/salty residue on your fingers. Smell test: Mild barbecue smell. OK.
From the package: The bag offers three recipes: Avacado Dip, Bacon and Tomato Dip, and Oriental Dip. ... There's a picture of a hamburger with onions, lettuce, pickles and tomatoes, surrounded by potato chips. 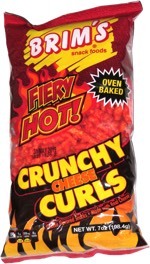 This snack was discovered by Jeremy at Smith's, 9851 W. Charleston, Las Vegas. Review published .